For people with depression and anxiety, everyday stress can become overwhelming. According to Thomas Cummings, Ph.D., a psychologist and yoga instructor at Mindful Matters Wellness & Yoga Center, yoga and meditation can provide great support for those with anxiety and depression disorders. “We know that we can calm the mind through calming the body,“ says Cummings. “There’s an extremely close link, an interplay, between the two. 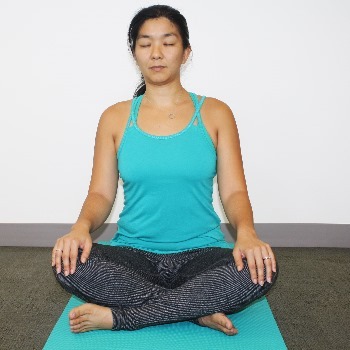 Yoga is a way of aligning mind and body so that one isn’t the victim of the other’s weakness.” Cummings uses a mindfulness technique called Mindfulness-Based Stress Reduction (MBSR) in sessions with his patients. In additional to traditional therapy, he employs a regular practice of sitting and walking meditations and yoga. The technique helps patients practice healthy ways of thinking like living in the present, learning to let go, and equanimity, or being content with what is. How To: Kneel on all fours with your shoulders over your wrists and your hips over your knees. Breathe in and slowly look up, pushing your stomach down and your hips up. Breathe out and slowly arch your back, bringing your chin into your chest. Repeat. Try this variation: Sway your hips side to side slowly. Cummings calls this “Happy Dog” pose. How To: Kneel on your mat and with your tailbone on your heels, or as close as possible. Fold forward, touching your brow to the mat with your hands overhead. Hold for at least five breaths. Try this variation: Kneel with your knees wide, tailbone to your heels, and fold forward between your legs. How To: Stand with your feet hip-width apart and fold at your hips. Reach your hands down as close to the mat as possible. Hold for at least three breaths. Try this variation: While you’re folding, grab opposite elbows with your hands and slowly sway your upper body side-to-side. How To: Lay on your mat with your legs at a 90-degree angle up a wall. Hold for at least three minutes. Try this variation: Place a pillow under your head or lower back for support and comfort. How To: Lay on your stomach with your head toward the front of your mat. Place your hands under your shoulders and push your chest up off the mat. Place your left knee behind your left hand so that it’s bent with your foot toward the right side of your mat, at a 45- to 90-degree angle. Push your hips toward the mat. Hold this pose, called Proud Pigeon, or lay over your left knee, placing your elbows or brow to the mat. Make sure your hips are level. Hold for at least five breaths. Repeat on your right side. How To: Sit cross-legged with your hands on your knees. Close your eyes. Hold for at least three minutes. During this time, expect thoughts to come and go. Just observe them, watch them pass by like clouds in the sky, and maintain focus. With practice, meditation will become easier. Look for more on yoga for anxiety and depression in the spring edition of Island Scene magazine.